All kinda of shocked here because of a lunatic who drove through barriers into a crowd gathered in Apeldoorn to see Queen Beatrix and family. It looked like something out of Grand Theft Auto. At the moment it looks as though it were the actions of a single person, who for some reason had planned to ram the royal bus. He's currently in intensive care. An Austrian group has been busy on a trailer for a film about Mobile phones in Africa. Complements nicely some new material I collected at Forum Oxford and the Africa Gathering a few days ago. More postings to come on that. Samuel Finlay Breese Morse (April 27, 1791 – April 2, 1872) was the US creator of a single-wire telegraph system and Morse code and (less notably) a painter of historic scenes. 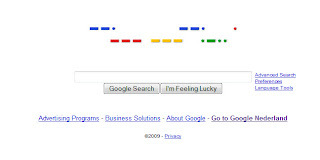 Google paid their respects today on their home page. Probably one of the biggest promotions for Morse in its history! Labels: "Morse Code" "Samuel Morse"
Everyone likes a countdown clock. Apple is using one at the moment to celebrate the billionth download of applications for the iPhone and iPod touch. Should be sometime in the early hours of tomorrow. But Apple will need to restruccture the way it handles applications for consideration. Its processing requests VERY slowly - people are getting annoyed. 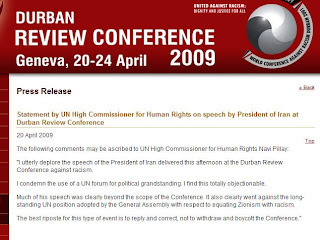 I think the UN High Commissioner for Human Rights, Navi Pillay, needs to consider her position and leave the responsibility for a review conference against racism to someone more capabable. She has an excellent career behind her, but if she couldn't anticipate the comments from the Iranian President Mahmoud Ahmadinejad this afternoon (which were utterly predictable), then why create the platform? Now the conference on a very important topic has ended in a complete shambles. It's no good wasting public money on something that was so obviously a disaster waiting to happen. If you haven't discovered the LIFT conference, then you haven't yet experienced one of the most interesting gatherings in Europe. Started in 2006 by Laurent Haug, it has grown into an ongoing discussion that now happens in three cities, not just Geneva. At LIFT-09 I had a long talk with Laurent about what's behind the LIFT concept and what he plans to do next. For my part, I am amazed at the broad range of speakers they find. Unlike other conferences, LIFT is willing to take risks in finding new talent - but also in coaching new speakers to get the best performance. It's not TED, but then it's not trying to be. It's different. Lifting the Lid on Lift - Surprising People as a Business from Jonathan Marks on Vimeo. I've discovered an interesting organisation that's been operating in the Netherlands for quite some time under the leadership of Peter van Lindonk. I only really got to know what they do when I bumped into Peter on a tram at the excellent LIFT-09 conference in Geneva. It turns out they have been organising a one day conference called PINC (People, Ideas, Nature & Creativity) for the last 10 years. They hold them in Zeist, a town right in the centre of the Netherlands. Around 500 people attend to get away from it all and focus, at least for a day, on something completely different. PINC has now started to organise spin-off events, with the same basic idea, but this time in a different location. I was invited to attend a PINC Tea on April 9th. Until a few days beforehand, we were only told it would be in Barendrecht, a suburb of Rotterdam. 24 hours before the event we got an address and a map, pointing to a car park next to a playing field. PINC is strict about timing on all of its events. Be there by 1410 said the e-mail. I heard there were roadworks on the way, so I left a bit early. In the end, I was too early - arriving at 1330. I remembered the tripod was in the back of the car, so made a spontaneous decision to film what happened next. PINC Tea - Concert in the Car Park from Jonathan Marks on Vimeo. Labels: PINC classicexpress "Peter van Lindonk"
OK, attendance at the MIPTV fair in Cannes was down. I tend to ignore the official registered figures because there were so many last minute cancellations. Great if you were doing serious business of course, more of a market of the serious and less of a total zoo. But some figures surprise me. Xinhua reported that China has made a record high worth of deals at this year's MIPTV, the world's largest audiovisual market, amid the ongoing global economic downturn. The five-day MIPTV trade fair ended its 46th edition, where China had its largest delegation ever, with more than 40 Chinese companies striving to break into the European and American market for television programs. China scored 6.49 million U.S. dollars of deals at MIPTV, the highest since it began participating in the fair in 1990, CITVC senior marketing director Cheng Chunli told Xinhua. What? 40 Chinese companies do deals at the world's largest TV market for 6.49 million dollars. Is that worth coming to Cannes for? Some phone manufacturers make that kind of money in a couple of hours. South Bank HD from Philip Bloom on Vimeo. I am increasingly impressed at how HD videographers are organising themselves outside the traditional film schools, experimenting with "cheap" technology and coming up with some stunning results. I'm uploading HD video interviews made as part of a documentary project, with the idea of grouping some of them into a channel along the same lines. I'd be interested in your feedback. An avalanche of brilliant advice from Robert Rodriguez.. I do something similiar to explain that being a cross media reporter requires curiousity, background research and a lot of hands-on interviewing in the field. If the broadcasters don't do something about it, the audience will solve the problem themselves. Labels: "Robert Rodriguez" "Film school"
Great idea. Twitter messages are too long. Flutter limits your messages to 26 characters. One full alphabet. Great parody on the twits. 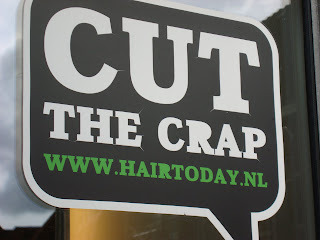 This is truly a brilliant name for a hairdressers' website. I presume the name of the shop Hair Today, has a subtitle - Gone Tomorrow. 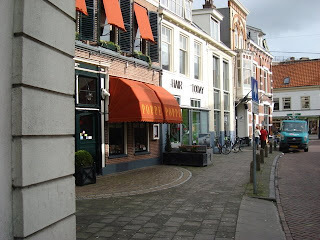 There are two of these shops it seems in the Dutch market town of Zwolle, about 90 minutes North-East of Amsterdam. 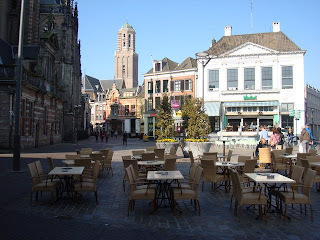 I really enjoy wandering around these market towns in the North and East of the Netherlands. Never underestimate the power of creativity in the provinces - they have to try harder to compete. Former DG of the BBC, Greg Dyke would be proud, having run a similarly worded campaign within the Beeb. (I wonder if he has Dutch heritage with a name like that). This reminds me of Zavertem airport near Brussels or CDG in Paris rather than Prague. Your friends will know you were parked in downtown Austin. Personally I would be wary of putting 219 dollars into a vending machine incase nothing came out. Seen at Memphis airport. Preferred Futures for African IT Projects - Erik Hersman from Jonathan Marks on Vimeo. In the days when I hosted a radio programme on Radio Netherlands Worldwide, I really enjoyed the documentary work in the form of safaris to see great projects in action. Now, after travelling the world a couple of times, it is time to release the video compilations of those who have inspired me so far. I've shot everything in HDV but only recently had the capability to edit it - and the context is becoming clear now. This profile looks at the work of the work of Erik Hersman, who grew up in Kenya and Sudan. For the last 5 years he's been organising innovative technology projects in Africa, acting as a catalyst for others. At the 2009 SxSW conference (www.sxsw.com) in Austin, Texas I got a chance to talk with him in some depth. I'm sure, like me, you'll be inspired by what Erik and his colleagues are up to. Check out his various blogs like whiteafrican.com and afrigadget.com. He also explains in the video more about his latest collaborative effort at ushahidi.com. Inside France 24's Media Lab, Paris, France from Jonathan Marks on Vimeo. This was five minutes well spent with France 24's head of new media technology lab, Michel Levy-Provencal. From studios on the south side of Paris, he leads an enthusiastic team of developers who are sharing their ideas with the public to great effect. They launched the first live-stream TV ap for the iPhone & ipod Touch, ahead of the BBC and other public broadcasters. It means you can watch TV programmes live or on demand from France 24. They were first because they believe in crowd-sourcing. Giving things away and asking for help works much better than trying to invent for the public on their own. I see they are also organising small scale events with the public, including participation in LeWeb and the TEDx Paris affiliate programme. Greasing the wheels of trade through local mobile payments from Jonathan Marks on Vimeo. Simon Cavill is doing some brilliant work in the field of mobile payments. It's happening all over the world, but especially in rural areas of Africa, where ATM machines are scarce and most people don't have a bank account. The mi-pay method focuses on the diaspora who are crucial to the economies of many African countries. Global aid is estimated at 60 billion dollars. The amount sent back to Africa through the diaspora network is ten-fold that figure - and 600 million may be an underestimate because this form of informal trade is difficult to measure. Personally, I see mobile payments as being very important to ensure that correspondents working for radio and TV stations get paid for their work. I know that so much training in developing countries turns out to be a waste of time because those trained cannot make a career out of what they learned. In this interview, Simon explains how the system works and why it is growing so fast in developing countries. 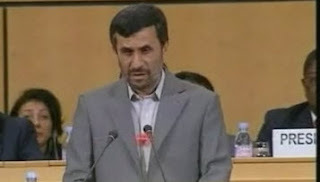 I spoke to him at Forum Oxford, and see that he is contributing to the next conference in Oxford on April 24th 2009. Well worth showing up to listen. Sony pulled out of IBC 2009, deciding to concentrate on a more direct approach to its customers - even starting a broadcast TV channel to dealers...In short they are going to see their customers instead of paying millions of euro to appear at exhibitions in the hope that people will see them. Panasonic went a while back. I wonder who will be next? Gone are the days when people waited a year to announce something new. And those who have got into the spiral of "doing conferences" have started the search for a different approach. This reminds me of the Comdex situation a few years back which went from boom to bust in the last downturn. With major belt-tightening right across the broadcast industry, I would be surprised if IBC did not suffer very badly this time round. If you want to get a perspective on why a lot of what's being discussed in London at the crisis summitt is probably less than what's needed, just watch this excellent video from last year's Poptech.